The young luchador has been impressive in the early stages of his career. Along with fellow luchador Rush, Bandido opted to sign with Ring of Honor in 2019 instead of joining the WWE. Bandido recently spoke with SoloWrestling.com about several things, including which promotion he isn't interested in and what he wants to do next. WrestlingInc.com carried news of Bandido's interview. Bandido was so popular so fast in Mexico that Cody and the Young Bucks decided to put him in the main event match at All In last September. Since then, the young wrestler has joined ROH and became a member of the new faction Lifeblood along with Mark Haskins, David Finlay, and Juice Robinson. Due to ROH's ongoing relationship with New Japan Pro Wrestling, a lot of talented superstars get to ply their craft overseas as well as in North America. Bandido is also now enjoying the fruits of that relationship between NJPW and ROH and he has his sights set on more appearances in Japan going forward. 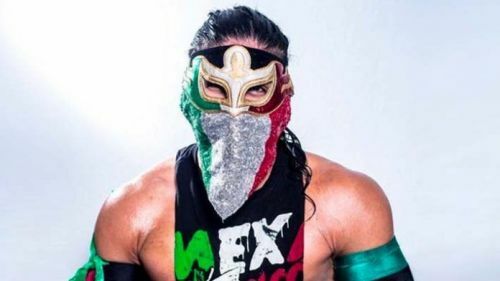 "It would be a dream come true to represent Mexico in the Best of the Super Jr., or in any other New Japan Pro Wrestling tournament," Bandido ssaid. "Before signing with ROH it was impossible for me, because you have to be signed to CMLL in Mexico if you wanna do something like that. But now that I have this contract with ROH, I hope the partnership helps." When referencing what he hopes to do in the future, he mentioned that he wouldn't likely be going back to where it all started for him in CMLL. A lot of wrestlers look to expand their horizons for their careers, but some superstars are more than content with staying in their home country. Traveling the world isn't for everyone, but the business is booming now more than ever. Bandido is perfect for the Best of the Super Juniors Tournament due to his size, speed, and style. Expect him to show up in NJPW more as he grows his star even more. He's still in his early 20s, so he's going to be around for a long time, thrilling fans with his exciting style. It also appears that having issues with one's creative direction isn't solely a problem that arises in the WWE but in most promotions. Which pro wrestling champion had the best 2018?